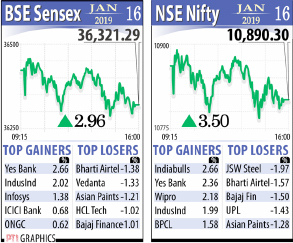 In the Sensex pack, Yes Bank, IndusInd Bank, Infosys, ICICI Bank, TCS, SBI, Reliance Industries, ONGC, Axis Bank and NTPC rose up to 2.66 per cent. On the other hand, losers included Bharti Airtel, Bajaj Finance, Asian Paints, Vedanta, HCL Tech, HUL, Hero MotoCorp, Kotak Bank, HDFC, HDFC Bank and ITC, declining up to 1.38 per cent. Global investor sentiment was cautious after British Prime Minister Theresa May’s divorce deal to leave the EU was overwhelmingly rejected by MPs, triggering a no-confidence motion against her government and leaving the country with no plans for Brexit on March 29. This is the biggest defeat for a sitting British government in history. London’s FTSE fell 0.61 per cent, while Frankfurt’s DAX was up 0.22 per cent and Paris CAC 40 rose 0.20 per cent in early deals. Elsewhere in Asia, Korea’s Kospi rose 0.43 per cent, Shanghai Composite Index ended flat, Hong Kong’s Hang Seng was up 0.27 per cent, while Japan’s Nikkei fell 0.55 per cent. The rupee, meanwhile, depreciated 20 paise against the US dollar to 71.12 in intra-day trade.